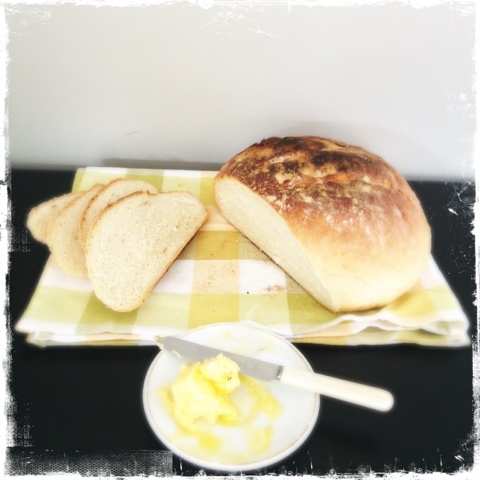 In the world of baking there is one craft that gives me huge satisfaction + that is bread making. The process from beginning to end demands such precision that one lazy move on your part + it all goes belly up. The chemistry alone is fascinating such as the relationship between the yeast + salt, it's like an old fashioned disco boys on one side girls on the other with the dance floor in between. HA funny but its true with Paul Hollywoods recipes for bread he explicitly says in your bowl add the yeast on one side and the salt on the other as the salt will effect the yeast and make it lazy I suppose. So for this cob recipe I literally read it and read it again followed it to the letter, when mr Hollywood tells you to knead the dough for 5-10 minutes by god you knead that dough for 5-10 minutes I think I kneaded it for a good 10 minutes with the fear of failing. Long story short this is a super beginners bread and once followed properly is a smashing bread to make over and over. Firstly in a bowl I popped in the flour + then sprinkled the salt in one side + the yeast on the other. Pour most of the water in on the flour + add the soft butter, next combine them all together as your mixing add the remaining water drop by drop. Keep combining until the inside of your bowl becomes clean. Once 10 minutes is up you will end up with is silky springy dough mr Hollywood would be proud of. For the cob you need to transform this into a sphere do this by tucking the dough under itself whist constantly swiveling it.